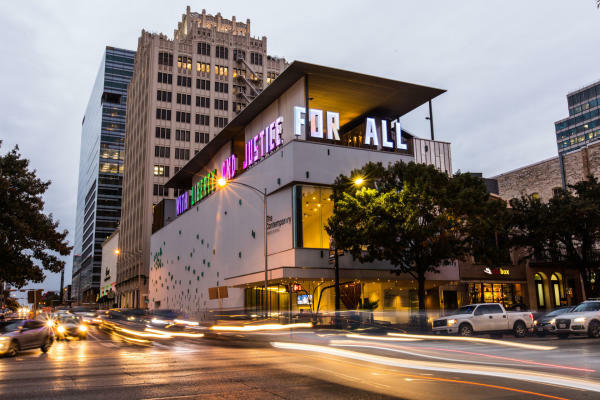 If you&apos;re looking for an engaging way to spend a peaceful day in the capital city, the answer is The Contemporary Austin. Home to two unique museums, both Laguna Gloria and the Jones Center offer world class modern art experiences along with family-friendly events, workshops and community events. 03 Tom Friedman, Looking Up, 2015. The Contemporary Austin Betty and Edward Marcus Sculpture Park at Laguna Gloria. Credit Brian Fitzsimmons. On the shores of Lake Austin and a mere 10-minute excursion from the hustle and bustle of downtown, the Laguna Gloria branch of The Contemporary Austin Museum is the perfect place to experience the latest and greatest sculptures and designs. Grab a quick coffee in West Austin at Mozart’s Coffee Roasters, then drive up the road to where the museum lies at the foothills of Mount Bonnell. The first thing you spot when entering through the rustic front gate is Tom Friedman’s “Looking Up” sculpture, a 33.3-foot man covered entirely in aluminum. The aesthetic of the sculpture in front of the welcome center, a 1916 Italianate villa, sets the tone for a stimulating contemporary art experience. 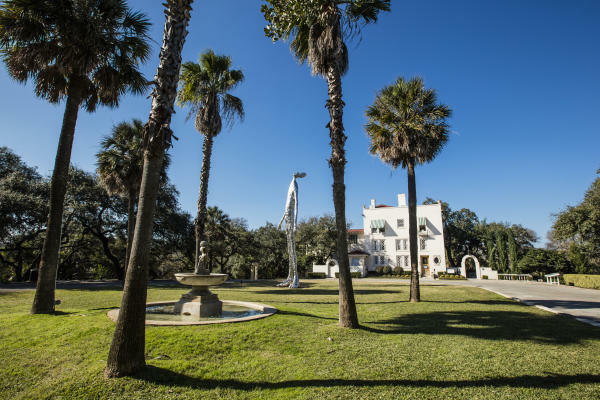 Laguna Gloria is part of The Contemporary’s “Museum Without Walls” program, which aims to provide the public with outdoor exhibits at diverse locations around Austin. The entire museum is outdoors, and a trail extending out from the back door of the visitors center leads you through an alluring circuit of contemporary art. The diverse exhibits include works from local, national and international artists. The time to complete the circuit ranges between 30 minutes to an hour. The Contemporary Austin Jones Center. Courtesy of The Contemporary Austin. For those who prefer “in your face” art, the Jones Center on Congress Avenue is a brisk 10-minute stroll from the Capitol. This branch of The Contemporary offers an abundance of potential Instagram posts due to the unique and modern art and design. The museum recently was awarded The Architect’s Newspaper​’s 2017 Best of Design Award for Adaptive Reuse, and anyone who is fortunate enough to stroll by will see why. Eric Bunge, one of the judges for the competition, described the building as “simultaneously serious and whimsical, the project is a beacon not only for Austin, but for adaptive reuse in general - inspiring for its inventiveness.” Although the exterior is arguably the most popular aspect of the museum, the interior contains a strong artistic presence as well. The museum will feature a new exhibit, Rodney McMillan’s “Against a Civic Death,” opening February 1, 2018. Contributed by Visit Austin Marketing Communications Intern Jonah Camberg.